We are leaving Cuzco to go to Arequipa. On the road, there are many buses making the journey between both cities. After a riding day, we are stopping by the Checacupe hotel owned by a welcoming couple in the small village of Checacupe. 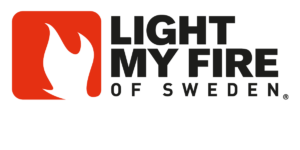 We will sleep in our tents on their fields, the rooms being occupied by doctors and specialists giving free treatments to the village inhabitants. 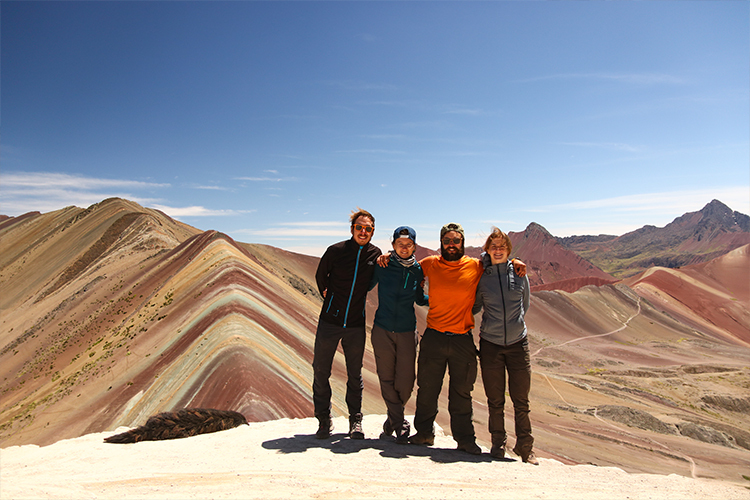 The next day, we are going to Winicunca to discover the rainbow mountain. We are leaving the main road and we continue our journey on a track during around 30 kilometres. After a last steep hill, we reach the refuge indicating that the last five kilometers need to be done by foot. The landscape is glorious, the red colours of the surrounded mountains contrast perfectly with the snow-covered summit and the blue of sky with no cloud. The hike is not easy, the difference of height of 5000 metres make the effort harder. Indeed, two British couples have preferred to climb up with a horse. Once reaching the next summit, the 7-colour mountain reveal its beauty. With the sunshine, we can see perfectly the different stripes of colours. The surroundings over 360° is incredible. 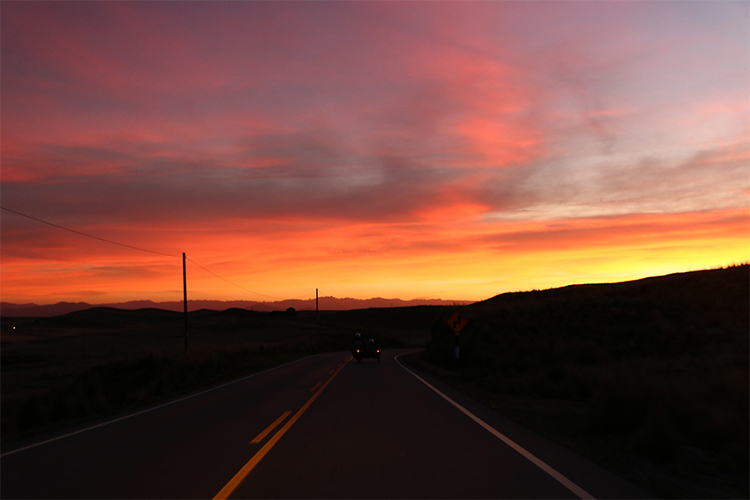 After this ‘wow’ moment, we are going backwards and go back on the sidecars to continue our journey towards South. We make the choice to leave the main road going by Juliaca, too much traffic for us and we prefer to pass by Espinar to go directly to the Colca valley. After going up the 7-colour mountain, we are a bit late on our schedule and we arrive by night in Espinar. On the road at the dusk, it’s a bit chilly but there are beautiful colours lighting up the mountains and surrounded field. The next day, after crossing the Consorama village, we are going towards the Yanquee village and we use the nicest track from the beginning of our travel. With no traffic, we can enjoy the glorious landscapes over the mountains alongside the “Lago del Colca”, a huge artificial lake with an intense blue isolated between summits. After many loops, one after another one, we arrive at the entry of the Colca valley. 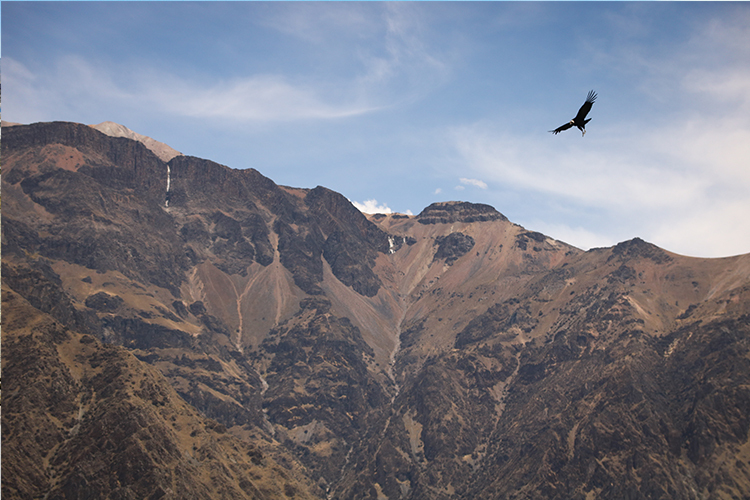 A few kilometers, and we reach quickly the “Mirador del Condor”.The place is well known by everyone to enjoy the show offered by the condor family living in the mountainside. After waiting some long minutes and even doubting that we will see this majestic raptor, it’s finally by going a few hundred metres further away that we can see a show of 4 majestic condors. They will fly back and forth above our heads until making our heads spinning. A few kilometres further away, it’s at Arequipa, the second city of Peru by the number of inhabitants, that we will spend the two next days. Arequipa, also named the white city, due to the colours of the walls, seduce quickly its visitors. The “Plaza de las Armas”, main square of the city, is full of animation from the morning to the evening. It’s a place very nice since the traffic has been forbidden. Another thing not to be missed in the Peruvian cities, it’s the covered market which here offers again an amazing show of life, colours and smells. We will take advantage of this stop by doing gift shopping for our families during this Christmas season, before to go back on the road towards the Titicaca lake and the Bolivian border. On the road to Juliaca, we are nicely surprised by the colours of the “Laguna de Laguinillas” that we can see from the roadside. 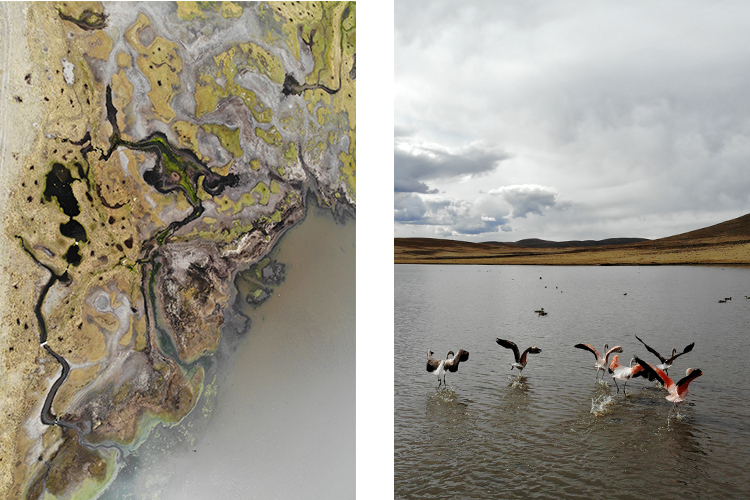 By getting closer to the edge, we can see beautiful pink flamingos eating planktons in the colourful water of the lagoon. We didn’t hope to see those birds here and were thinking to make a detour to observe some by finally we have been lucky enough to meet for the first time this unusual bird. 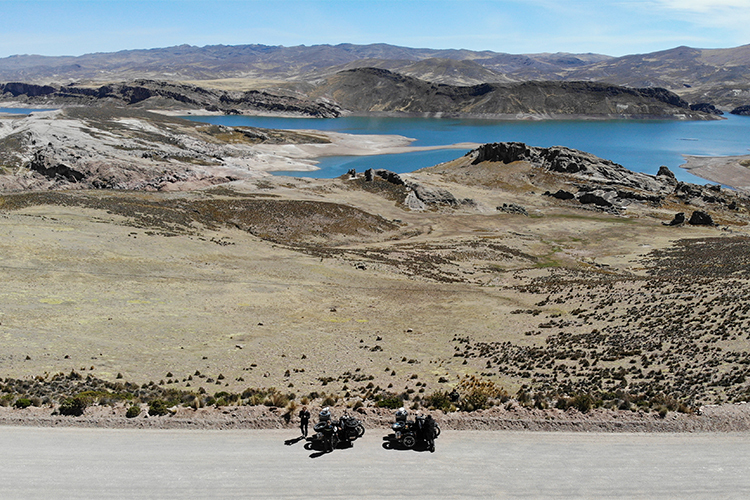 Once we reached the Titicaca lake, we are going along it until reaching the Bolivian border. We made the choice to cross at the small border post of Kasani to continue our road alongside the lake and to reach the Copacabana city in Bolivia. Here no carnival or capoeira, but other advantages that we’ll tell you later. In a small square courtyard, just after the « Plaza de las Armas », we are enjoying here a vegetarian menu for nothing. Delicious food, perfect with an Arequipeña, the local beer. At this place, we enjoy delicious burgers at a good price. The spot is well known by the backpackers who can meet on one of the two big tables in the small restaurant.